Last week I met up with Ben for a day on one of my local rivers. He was back home in Scotland visiting friends and family for a short time and we promised we’d get some fishing in together. If you can’t remember who Ben is, check out this post from Tasmania. We were fortunate enough to have a good forecast for the day we’d chosen, intermittent white cloud and sunshine, warm temperatures and a moderate wind heading predominantly downstream. There’s always a little apprehension in the air when you promise to take a mate fishing as you want to show off your waterways to the best of their potential but considering I hadn’t fished the river since returning back from overseas I didn’t really know what to expect. What was in my favour though was old knowledge of the river, recent updates from other mates and a burning desire to catch some good fish. 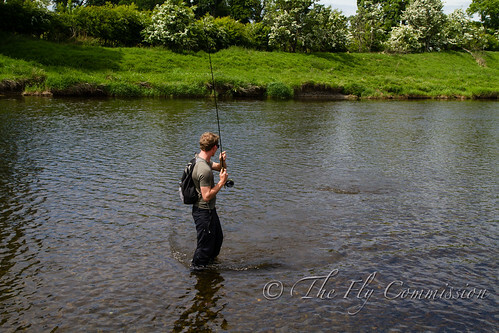 We met on the banks around 0930 and set off down the river with the intent of fishing back to the car. The first thing that greeted us was hordes of Iron Blues hatching off the and fish were happily obliging. The entire river was alive as we walked down and it was a tough decision to walk away from rising fish but we of course knew that when we reached our destination we would be rewarded with big fish for our efforts. The first fish we decided to stop at was a tricky one, in fact, I should probably clarify that most of the fish in this river are tricky, the larger ones even more so. These fish are some of the hardest to catch trout of anywhere I’ve fished so it was no surprise that after about 10 casts Ben still hadn’t hooked it. It was a tough spot to get a good drift but even when he nailed it the fish didn’t oblige. Eventually I suggested he try a little spider to try and get something in or just below the film rather than on top, first good drift with the little cdc spider and the fish was on. Unfortunately what followed was a release just before the fish came to hand. Next up it was my turn to put a number of casts over a fish to be completely ignored. My typical approach is to see a fish rise, get into position, wait again for the fish to rise (assuming there’s enough food coming down), then make my cast. If the drift isn’t spot on, cast again, if the drift was great but no response, cast again. After a couple casts if there’s been no response I’ll wait and see if the fish rises again. I’m sure you can imagine that if you’re getting good drifts and the fish isn’t taking yet still rising to naturals it can be absolutely infuriating trying to tailor your approach. You need to ascertain is it subtleties in the drift that is putting it off, are you fishing the wrong fly, wrong size, wrong life cycle, wrong part of the water column and sometimes you just keep casting. Well in this case I changed fly and kept casting, off came a cdc dun and on went another in a slightly different style but still no response. Eventually you start to believe it’s not going to happen and the fish takes catching you completely off guard and you strike into nothing! This became somewhat of a theme over the day. We decided to walk a bit further downstream again to try and gain a little shelter from the wind that had picked up by this point and a good decision it was. We got slightly more cover but lots of rising fish. Ben was the next to get amongst the fish and started missing them left, right and Chelsea (thanks Craig!) on a para dun. He tried speeding up the strike, slowing it down but nothing was working all of them just resulted in no hookups. Just upstream from Ben another good fish was rising on the far bank, I could see the thin outline of the fish just below the water and it rise periodically taking fairly large olives from the surface. On went an appropriate cdc dun and the casting commenced. It was a tough spot, rising just off some surface weed, faster water where it was, slower water across the rest of the river and a downstream wind. Eventually I nailed the drift, up it came and I missed it. I couldn’t believe it, what a rank amateur move but… it rose again. A little surprised by the fact the fish wasn’t spooked, I cast again and a couple casts later I finally got it. It’s amazing just how difficult these fish are to tempt. Strangely the best part of the day came when neither of us had any fish but the weather revealed a sight you don’t normally get to see. The water conditions right now are very low and clear and with the mid afternoon sun lighting it up we got an insight to the underwater world. My sight fishing has typically been limited to New Zealand, Australia and the US but last week I was able to sight fish a river in Scotland. Fantastic! I’m bound by my own code not to give too much information away but it was stunning to see such a large number of big fish. Most we spooked as whilst we could sight fish, it was not clear enough to see them from a suitable distance to get a shot in. There was one fish however, sitting the in the middle of the river, nymphing. He wasn’t spooked. Both Ben and I estimated this fish as definitely being over 5lbs. I rigged up a dry with a lightly weighted pheasant tail a few feet below. My first cast over the fish landed perfectly getting a good drift and the fish started to move sideways. He turned, I saw the white of the mouth, my dry dipped under and I struck. Almost instantly my heart sunk as I felt no resistance as I watched the fish swim away. This would have been a whumper trout but it wasn’t to be, I was gutted but also incredibly excited that these fish were sightable and catchable during the middle of the day. I said to Ben that whilst I’ve caught hundreds of fish on that method, it’s probably the first time I’ve stuck into nothing. Usually it’s a guaranteed hookup but the planets just weren’t aligned to top off my day. We fished back to the car around early evening as Ben had to disappear to pack his bags for a flight in the morning. He’d missed around 6 fish for the day and I’d missed 5, frustrating it was but an absolutely superb day with good banter and sublime fishing. We could have had more fish to hand, and good fish at that had certain things gone our way but as a whole it was one of the most enjoyable river days I’ve had. I decided to fish on until midnight losing another fish around 2lb and landing a couple tiddlers. 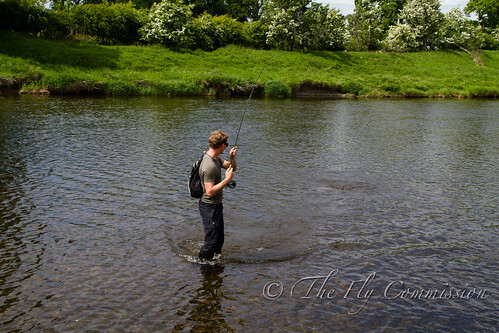 Fishing with a good friend, sight fishing to large trout in Scotland, now that is just superb. Better than the Southern hemisphere?? When do you fancy a lesson? 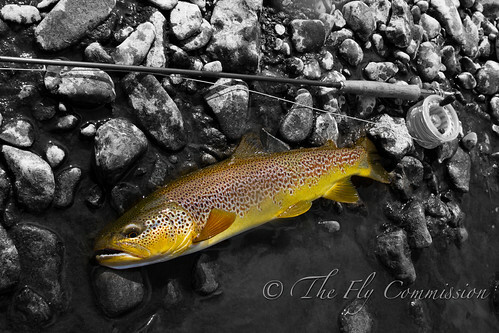 Cracking brown, Scott! Better than I’ve caught for a couple of months. Caught a couple more last night, that’ll be for the next update! Nice to get into some good fish at home cause they really are hard fought for. Nice fish. All those missed takes are typical at the moment I fear and the fish coming short or spitting quick. I noticed recently I hookup more fish when I am not paying attention and my drift is less than perfect. What time of day could you spot fish in the water? I have seen a few but not easily to watch them feeding below. Only missed one the other night which was encouraging! Hard to say exactly what time but I reckon it was between 3 and 7, definitely within that time frame. We were on a high bank, a little elevation was definitely needed and the sun was cutting in from behind us. We could spot fine but most fish we just couldn’t see far enough a head, some we could though.